Incredible Hulks #632 was an awesome issue, because it was just an absolute adrenaline rush! We got epic action and drama, not to metion some tension involving Rick & Jen. Pak is truly giving us some great stuff in this finale. I mean, here we have Hulk fighting and defeating Lord Armageddon, who is easily a Thanos-level villain in my opinion. 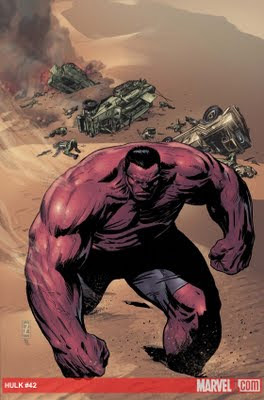 Not to mention Hulk destroying the entire Troyjan Armada and nearly ripping the planet to pieces just from his shockwaves alone... not even taking a single footstep yet! Great stuff, and that last page with Umar, it's only going to get better! It is a shame that Hardman is leaving after Red Hulk #41, but at least we got a good replacement. I'm also intrigued in the Mighty Defenders series, but I just don't see Hulk as a villain. I really hope this isn't the project involving Jeff Loeb. 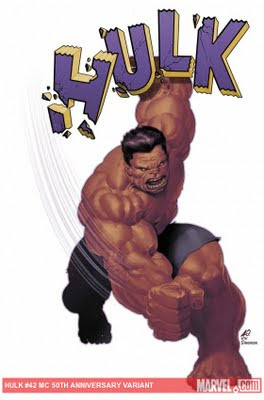 Also, it could be argued that the word "Offender" on the Hulk teaser could actually be "Defender", considering that it's cut off somewhat. Anyways, great stuff! Keep up the good work, Gary! 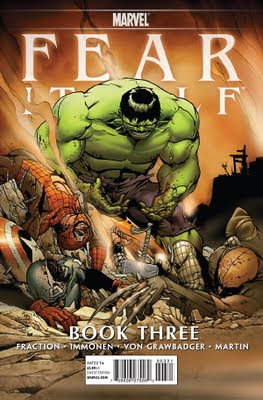 I agree about the Fear Itself miniseries; it's a dud. I've never been that impressed by Fraction as a writer (though haven't read that much by him), but it seems clear enough that the main storytelling engine here is big pictures of fights. Maybe it's the fact that the EiC is an artist not a writer, but since Quesada took over at Marvel the company has de-emphasized what had been considered basic narrative principles in favor of spectacle. 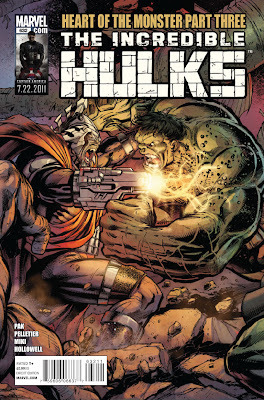 I have a feeling that the Hulk in question is the Red Hulk and not the green one. Also, Attuma and Creel have been shown obtaining their hammers. KHM, very few of the describers in the Defenders promotional image indicate the Red Hulk has any part in this event. ("Offender" may be the lone term to suggest him.) 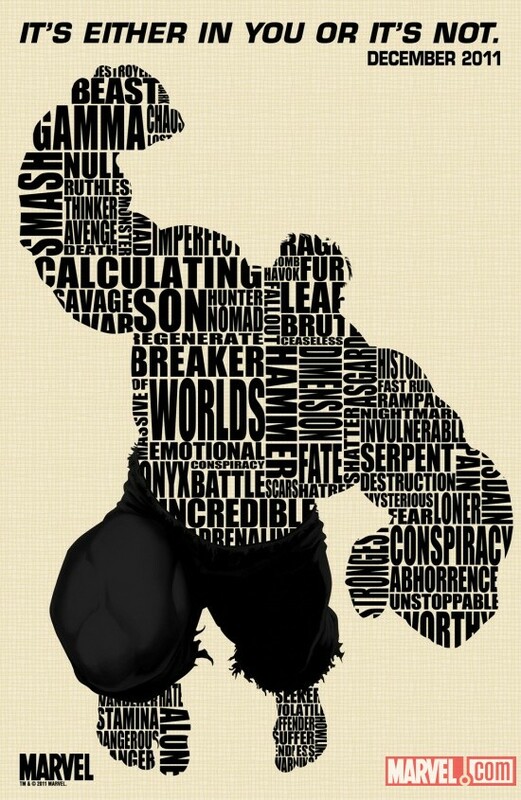 "Son," "Nul," "Imperfect," "Incredible," "Breaker of Worlds," "Nomad" all rather pointedly mark the figure as Banner. In addition, yes, Creel has been shown obtaining his hammer...in Iron Man 2.0 #5, another book that is not the main Fear Itself title, exactly as I stated, which is the leading problem I have with the series. Unmentioned previously, the Grey Gargoyle got his hammer in Invincible Iron Man #504. I still don't know where Attuma got his hammer because he already had it in every book I've read. Great article and I dig the format experiment. I'm thinking of experiment myself by branching off into a podcast and may drop you a line about that if you are interested. After some financial difficulties, I'm getting back into the Hulk and it looks like it could be an interesting time to do so. I had dropped off just before Planet Red Hulk in Hulk and after the Savage Land story in Incredible. Looks like it'll all be changing soon. I'm actually really enjoying Fear Itself and am not picking up any tie-ins other than books I read anyway (Iron Man, Thunderbolts, Black Panther and Uncanny X-Men). I don't find the lack of detail distracting at all, but maybe that's just me. I think there's just enough going on in the main book to tell a cohesive story.